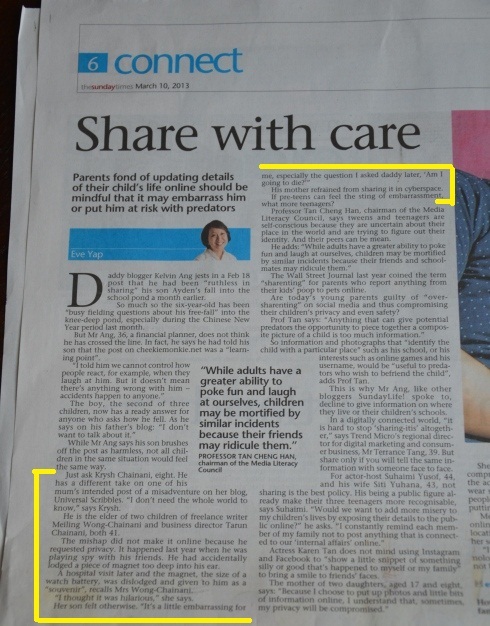 We are so excited to be featured in The Sunday Times (Singapore)! What made this so exciting is that this is the FIRST time my son and I shared the same media space and were interviewed together. He was in reporter Eve Yap’s own words “quite mature for his age”. I’m also very happy to see our family photo in the papers seen by hundreds of people no less. The kids could not wait to show them off to their friends in school. Everyone wants to know who the dolphin is and where we had this picture taken. It was taken on our recent trip to Dubai at Dolphin by the Bay at the prestigious Palm Atlantis. The dolphin’s name is Tina. But back to the newspaper feature! This feature on Sharenting was a follow-up to my recent participation as a panel speaker on Growing Up On Facebook during Social Media Week in February. Sharenting is a term coined in the United States for parents who share too much information of their children online via Facebook, blog or twitter. What are your thoughts on Sharenting? 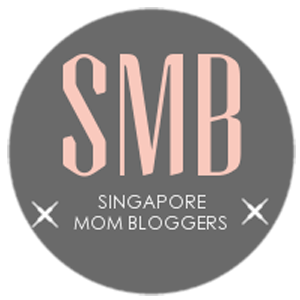 If you enjoyed reading this post, do share your thoughts or experiences with me. I will love for you to connect with US on Facebook, Instagram, or Twitter.